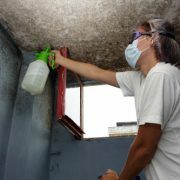 Mold prevention and mildew prevention should be practiced in every home and business. Mold and mildew are fungi that spread over where moisture is found. They provide a vital purpose in our environment by eliminating organic materials like leaves, which in turn, makes soil enriched. That said, that very attribute can lead to a serious health problem for those in a home with mold in it, such as sinus congestion; respiratory problems; headaches; and irritation of eyes, nose, or throat. Kids, babies, senior citizens, pregnant women, and those already suffering from respiratory issues are at a greater risk for such concerns. 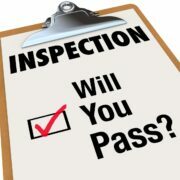 Inspect areas in your household where water damage or high humidity might be present, like a crawl space or damp basement. Mold and mildew can spread on ceiling tiles, wood products, wallpaper, cardboard, drywall, carpets, plants, fabric, insulation, and food. Such growths can develop on surfaces that are damp within a day or two and create airborne spores. They will break down and damage whatever they are growing on, which can result in moderate to extreme health concerns for your loved ones. 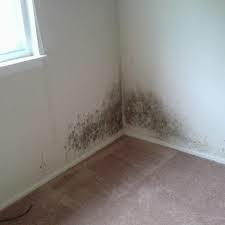 Mold issues usually begin during humid and hot summers when you start using the air conditioner. However, if the thermostat is too high, the air conditioner won’t dehumidify the air properly. If it is set too low, you could present a platform for condensation of water vapor. To stop moisture issues and optimize energy efficiency, the thermostat should be set to 78 degrees F.
When windows and doors are open, you allow the air conditioning to seep through gaps, which brings humid air into your cool home, making you waste money in the process. This leads to condensation, which mold thrives on. Ensure that the windows and doors are closed when the AC is running. Further, keep the temperature in your household at approximately 80 degrees when you’re not home. Usually, we crack the thermostat up to 85 degrees or switch off the AC when we’re not at home. This increases humidity and temperature, which leads to the perfect setting for mold to develop. Where there is moisture, mold will grow. As such, a dry house is necessary to stop mold growth. A hygrometer should be installed in your household, which will quantify the levels of moisture in your home. To stop mold growth, your interior humidity levels should be kept under 60%. A dehumidifier will take away all airborne moisture that you can’t do anything about and will aid you in regulating the home’s humidity levels. It’s especially vital to have dehumidifiers in damp spaces, like crawl spaces and basements. If your house is big, think about placing a pair of humidifiers in opposite sections of the home. If the source of the problem isn’t the air conditioner, look for chronic dampness or standing water that is raising the humidity inside. If you have at least a 60% of a high humidity reading, ensure your air conditioner is running as it should be. Is the right temperature set? Is it sporadically cycling off and on? When the set point is reached, is cold air being blown? How clean are the coils? Have a look at the condensation drain pipe (the thin white pipe protruding from the side) to ensure its dripping normally. The pipes might be blocked if it isn’t, and water might be collecting on your floor or within the unit. If you believe this the case, contact your local HVAC representative. To stop mold buildup and blockage, pour a cup of water and bleach down the drain once a year. Groundwater dripping into crawl spaces can lead to an abundance of moisture vapor penetrating your home each day. The easiest solution to this is to have crawl spaces covered with a vapor barrier made of plastic — 6 mil of landscaper’s plastic (polyethylene) — that contains grounded moisture. If you enter your crawl space on a regular basis, use heftier plastic that won’t tear apart easily – you can find plastic coverings as thick as 20 mil in some stores. If there isn’t a dryer in your household, or you are more partial to have your clothing line-dried for energy saving reasons, the clothes should be regularly hung outdoors. Evaporated water from clothing will become airborne inside the house, which can result in the growth of mold on floors and walls, among other surfaces. During colder seasons, if your clothes are air-dried indoors, ensure that air is circulating, that the room is properly ventilated, and that fans are used to push indoor moisture and air outdoors. 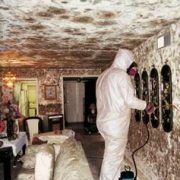 If you are unable to find the source of the moisture by yourself, or you aren’t familiar with how to resolve an issue once discovered, get in touch with a mold remediation specialist for assistance.